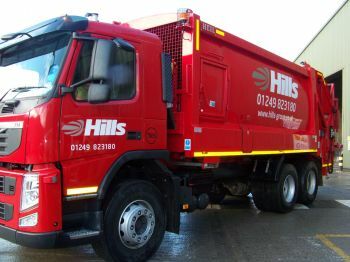 The latest Hard Disk Recording technology from Innovative Safety Systems Ltd (ISS) has been specified by Hills Waste Solutions for its 13 strong fleet of RCV’s that carry out commercial waste and recycling collections in and around Wiltshire. The ISS system was recommended to Hills Waste Solutions by Wiltshire Council. In 1996 Hills Waste Solutions signed an agreement with the then Wiltshire County Council to handle its municipal waste. Initially Hills took responsibility for Household Recycling Centres and later for kerbside collections. The company also runs Materials Recycling Facilities, transfer stations, waste treatment facilities and landfill sites in the area. In 2011 Hills achieved diverting 1 million tonnes of waste away from landfill across Wiltshire and is currently commissioning Wiltshire’s first mechanical biological treatment plant (MBT) - The Northacre Resource Recovery Centre, a state of the art waste treatment facility at Westbury that is due to open in September. Coventry-based ISS provides a one-stop shop for the design, supply, installation and maintenance of vehicle safety and visibility technology, and is well known for providing market-leading products. Wiltshire Council have opted for the best selling RX2 DVR system, which comes with free mapping software and provides additional vehicle data such as speed, brakes indicators and G forces. For more information about Innovative Safety Systems tel: 02476 442 699, email info@iss-international.co.uk, or go to www.iss-international.co.uk.